This is a pretty and contemporary bathroom with large vanity and sink areas in neutral colours. Floor is a marble and cabinets a shade of white. 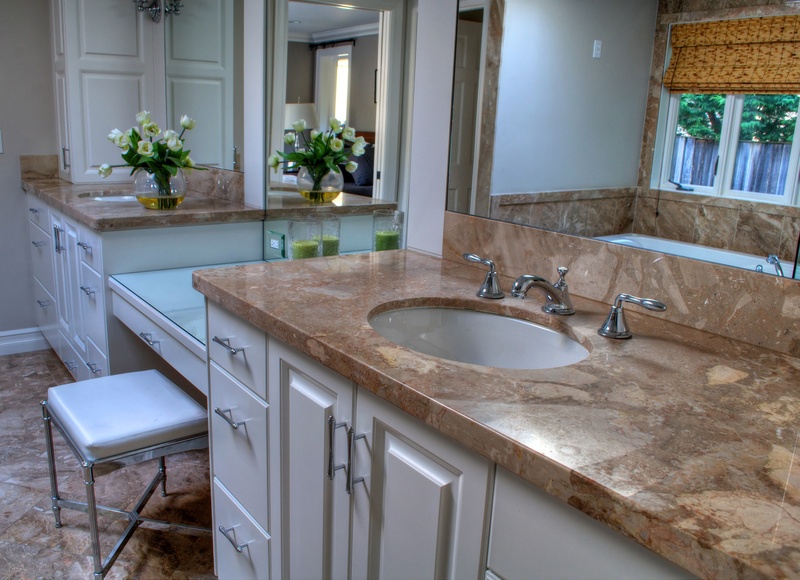 From adding a simply marble vanity to refresh an old vanity to creating a completely new marble bathroom, the options for having this beautiful stone in your home or business are endless. Marble bathrooms are typically a great investment as the stone is waterproof, easy to clean and looks great. These are just a few of the reasons that top hotels around the world install marble bathrooms in their most luxurious suites. Marble has been a popular building material for thousands of years and throughout history this beautiful stone has signalled wealth and taste. From the Taj Mahal to Buckingham Palace, marble is known for its timeless beauty. Today, thanks to technological improvements, we’re able to offer marble bathrooms, including sink surrounds, vanities, and marble tiles, to British families at affordable prices. If you added up all the time you spend in your bathroom, you’d be surprised. Some estimates suggest that on average, Brits spend about 1.5 years of their life in the bathroom – and this number will be higher when you’ve got kids to supervise or need to spend time getting ready for work. With the smallest room featuring so high on our time usage charts, why settle for something you don’t enjoy? A marble bathroom will maintain its value, it’s timeless style and elegance for years or even decades making it a great investment for your family. If you’ve got a small bathroom, a wetroom may be the best way to give you all the features you need without feeling crowded. 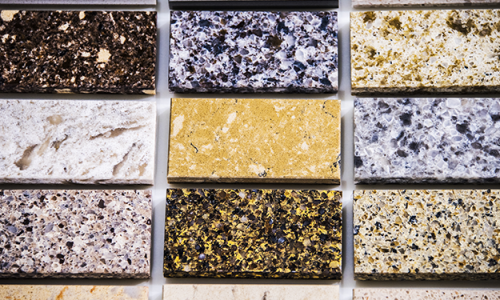 Marble is waterproof and, once sealed, doesn’t stain. It can’t rot, like wood, or bubble like vinyl. It also looks great – elegant and timeless. Too many wetrooms look like the showers at a municipal pool: unattractive and dull. At Surrey Marble and granite, we offer dozens of choices of stone tiles so that you can make your marble bathroom a thing of beauty and a joy to bathe in. Many British bathrooms are afterthoughts added into period homes. They may not have windows, ventilation is often poor and so damp and water are ever-present. Despite this, interior design magazines often show beautiful modern bathrooms decorated with entirely impractical materials: they may have wallpaper, which often peels in the damp, paint, which can let water through to the plaster, or soft fabrics and paper decorations which can be damaged or stained easily. Stone is impervious to water – it takes thousands of years for a river to wear away its bed. Marble tiles can be used on the walls, floor, bath surround and vanity cabinet – wherever you need them. Using stone tiles lets you create an elegant, enjoyable bathroom without compromising on the practical side. With a marble bathroom, your whole family will feel at home, whether it’s kids splashing, an adult showering quickly before work or having a relaxing bubble bath in the evening.